We arranged an exhibition between 22 October and 23 November in St Peter and St Paul Church, Medmenham of the wartime letters of John &apos;Charlie&apos; Hold. Charlie lived in Medmenham before the War and served in France from May 1916 until he was killed in action in December 1917. There is an archive of more than 90 letters that he wrote to his family that has been preserved in Leeds University Library Special Collections. We have transcribed the letters and published them. Copies of the letters are available from Marlow Museum. Alternatively please email us and we will send you a copy. The school remembered the 58 fallen from Borlase, boys and masters, and all those who lost so much through the four years of war and suffering. In addition to the exhibition the school presented music, plays, poetry and dance. 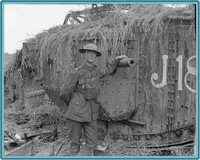 We held a display on The Causeway about the Battle of Amiens and the start of the Allies&apos; "big push" to end the War. We highlighted the role of Marlow men in this important battle. Follow this link to a short video on YouTube from the event. We held an exhibition of our research in the courtyard of the old Wethered&apos;s Brewery site, off the High Street, Marlow as part of the Love Marlow programme.